Skandia has been offering the finest in window treatments since 1966. Although their name made sound exotic – Skandia is an American company, offering made in the USA window shades, blind and shutters. Skandia operates manufacturing facilities right here in Southern California – as well as in Florida and Georgia. Skandia’s window shade collections come in a wide array of fabrics, colors, patterns, styles, opacities and operating systems. No matter what your design style – or light filtering needs – stylish Skandia shades are sure to make a style statement in your home. From sheer fabrics to blackout shades – to traditional roman or roller shades – to innovative motorization – Skandia offers it all. Take a moment to peruse some of Skandia’s window shade offerings, below. Then schedule a free in-home window shade consultation with our experienced window shade design team. We will bring samples of window shade styles, colors and fabrics to your home – and help you select the window fashions that fit your decor and your budget! Skandia transitional shades are named for combining the style of a roller shade with the function of a horizontal blind. 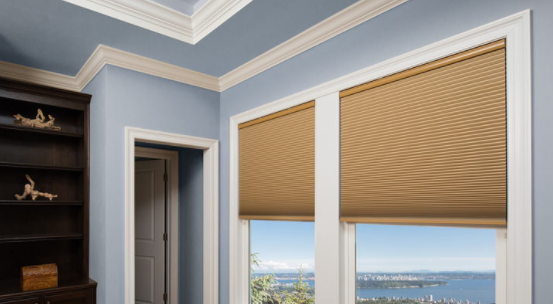 These innovative window shades offer dual fabric layers and alternating sheer/opaque bands, for the ultimate solution to any homeowners’ privacy and light control needs. Skandia transitional shades are available in n exceptional array of colors – and more than one hundred modern, on-trend creative patterns. They can also be chosen in a wide variety of light filtering and room darkening opacities. And for the ultimate in convenience, add optional motorization to these state-of-the-art window shades. Skandia woven wood shades are manufactured from a variety of all-natural materials, including: bamboos, woods, jutes, grasses, and blended yarns. Perfect for Southern California’s natural aesthetic, these window shades are hand-woven to create a look and feel unlike any other. Skandia’s woven wood window shade offerings are available in a wide range of colors. And this collection offers a diverse selection of patented, state-of-the-art lift system technologies. Skandia woven wood shades are also available with light filtering liners, blackout liners, or pleated privacy liners. This enables you to achieve the level of light and privacy you desire – while still experiencing the natural decor only woven wood can provide. 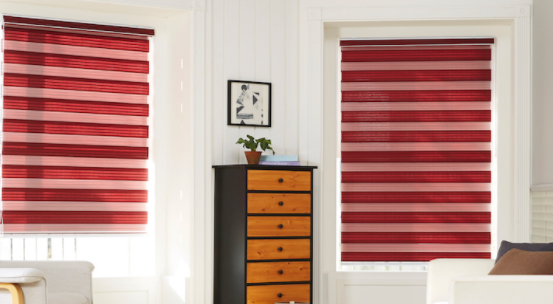 Skandia’s modern take on roller shades offers unparalleled smoothness and ease of operation. Their new and patented technologies in roller shade operation are nothing like roller shades of the past. Choose from a variety of opacities to meet your light filtering needs. Sheer fabrics allow the natural light to come in. Screen roller shades combine a view of the outside while also offering privacy and light control. 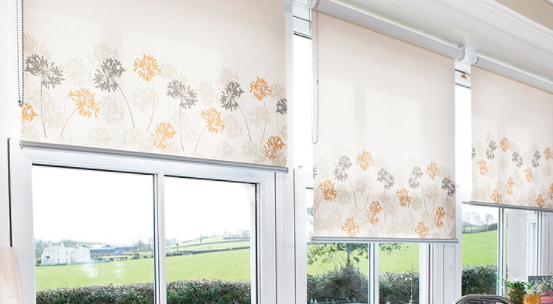 And blackout roller shades are ideal for bedrooms, children’s nurseries and media rooms. Coordinating or matching valance and fascia options are also offered, as are a variety of control and operating system options. Skandia’s cellular window shade collection offers the utmost in energy savings – while providing the widest selection of distinctive pattern and color options. Celluar shade construction keeps the hot California summer sun out – while insulating your rooms on cool winter nights. 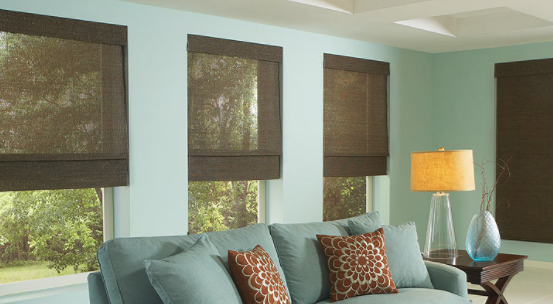 Additionally, Skandia’s cellular shade collection features a variety of light filtering and room darkening fabrics – to match your specific ambient light and privacy needs. And, Skandia’s innovative and intuitive shade lift systems provide a choice of creative operating alternatives. Especially popular is Skandia’s on-trend “top-down/bottom-up” operating system. And, optional cord-free systems offer the utmost safety for homes with children or pets.